While this student’s unit project on pendulums includes a lot of inside jokes from our class, it’s worth sharing because of his creativity in creating a story line about pendulums that flow easily with the intensity of the movie. Over the February break, my students had an end of unit project to work on. They were required to create a project that would clearly, creatively, and concisely communicate the essence of pendulums to someone who had never studied them within the context of Physics. I provided them with this rubric to guide but not hinder their creativity. So far, of the few projects I’ve graded, these kids have worked really hard to turn in remarkable projects. One student gave me permission to share his comic strip with you – it wasn’t part of his project, but he did it just for fun. It made me giggle so much that it needed to be shared. 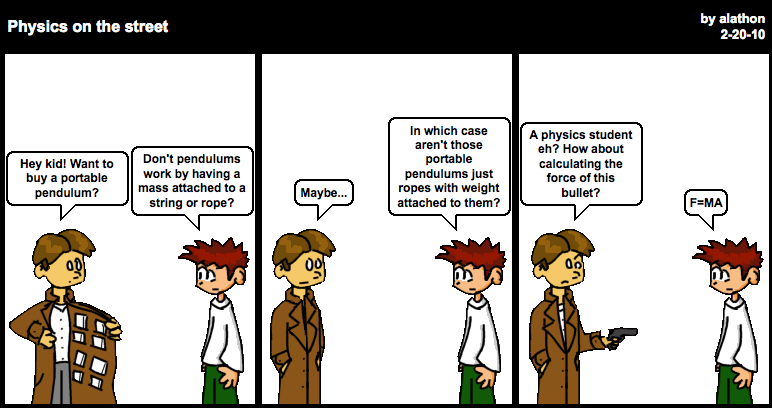 You can see all of his pendulum cartoons here.